Growing raspberries is truly simple, and it is therefore somewhat surprising that delicious raspberries are not grown more. They really are amongst the easiest fruits to care for and, as they flower late, it is possible to get good crops in areas where other fruits fail. 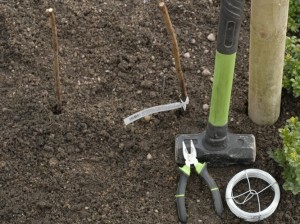 Choose a sunny or partially shaded position to grow your raspberries. 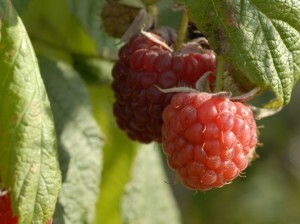 Raspberry canes can be planted from autumn through to spring, but avoid planting if the soil is waterlogged or frozen. You don’t need to grow raspberries in beds as shown below, and if space is an issue, you can plant single canes in large containers. 1. Plant in rich, well dug soil. 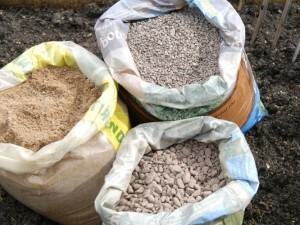 Cultivation after planting is tricky as raspberries make a mass of fine roots. Moisture is vital, as is good drainage. 2. Plant canes 60cm apart in rows 2m apart. 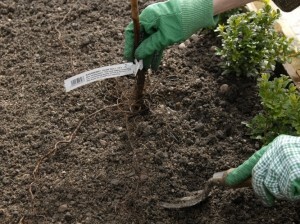 Spread roots wide and cover to a maximum depth of 5cm. Make sure the soil around the plants is well firmed. 3. After planting, cut the canes back to within 25cm of the soil so that there will be plenty of young growth to fruit the following year. 4. The brittle canes are easily trained on pairs of wires stretched between garden stakes 2.5-3m apart. Set wires 60cm and 1.5m from ground. 5. Spread grass cuttings or straw over the bed in spring to conserve moisture and suppress weeds. Weed to protect the shallow roots, and keep birds away with netting. 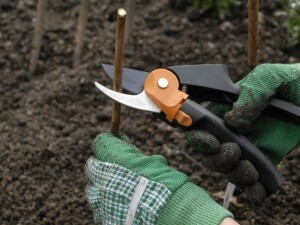 This entry was posted on Monday, February 13th, 2012 at 10:53 am	and is filed under Fruit Gardening, Gardening Guides. You can follow any responses to this entry through the RSS 2.0 feed. You can leave a response, or trackback from your own site.